The Galway footballers are heavily fancied to win when they take on Sligo in the Connacht semi-final this Sunday at Pearse Stadium (3.30pm ). The bookies have no doubts whatsoever about which team they expect will face Roscommon on June 17 in the Connacht final. Sligo are 8/1 outsiders to do the business this weekend; Kevin Walsh's squad is a huge 1/16 to advance, with the draw priced up at 20/1. Galway are minus eight in the handicap market; Sligo at plus eight in what some people will see as a possible punt. The bookies are basing those massive outsider odds on Sligo, who under new manager Cathal Corey, finished fifth in division three during the spring. Galway, on the other hand, topped division one, and progressed to the league final where they went down to Dublin. In last year's championship Mayo beat Sligo in McHale Park by 2-14 to 0-11, and Sligo subsequently went out of the qualifiers at the hands of Meath who defeated them by 0-14 to 1-09. The Yeats men beat London in the Connacht quarter-final earlier in May by 10 points (1-21 to 1-11 ) and they know they are massive underdogs on Sunday. Nevertheless, they will arrive in Salthill ready to have a right cut off Galway whom they have beaten twice in championship this decade when Kevin Walsh was their bainisteoir. They have some very experienced players, such as Ross Donavan, Charlie Harrison, Pat Hughes and Neil Ewing, who will know Walsh well from his time as Sligo manager. Under Walsh, they reached Connacht finals in 2010 and 2012, and were narrowly defeated by Roscommon in McHale Park (0-14 to 0-13 ) and Mayo in the Hyde (0-12 to 0-10 ). Sligo are captained this season by Kevin McDonnell and they will feel they have nothing to lose coming to Salthill having been written off in so many quarters already. While Galway are expected to win, there should be zero complacency in the Galway camp. Any time a Galway player even considers thinking they can beat a team without putting in a big performance, they need only cast their mind back to last July when a really inept performance against Roscommon saw them easily beaten by nine points – 2-15 to 0-12. 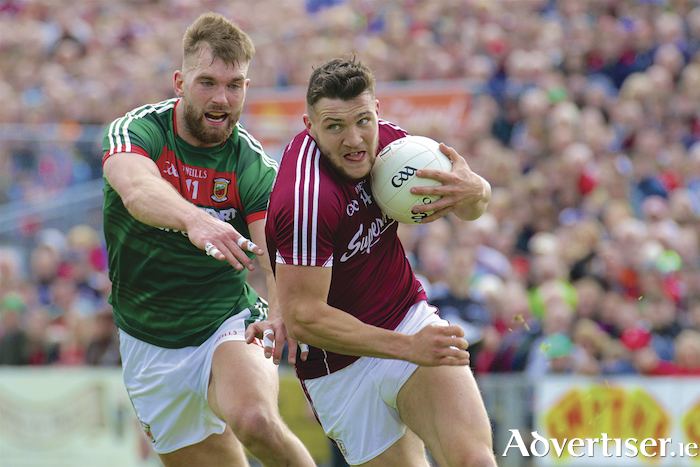 When Galway are fully focussed and up for the job in hand, they are very difficult to beat, as shown by their form since last January and their robust display in against Mayo in McHale Park. The addition of Seán Andy O’Ceallaigh at full-back has solidified the full-back line, and the zonal defensive structure that is being utilised means the opposition finds it difficult to get in on goal, to have a pop at the improving Ruairí Lavelle, whose restarts were impressive in the win over Mayo. There has been much speculation who will start this weekend, and plenty of chatter about whether Ian Burke will be in the first 15. His cameo performance when he was introduced against Mayo was hugely impressive and, if he is fit and well, it would appear from outside the camp to be a peculiar decision if Galway do not start him. That said, all the substitutes used against Mayo did well, and it was absolute confirmation that intercounty championship games are now won by teams with a strong squad, with five good subs who can come in and make a difference in the last quarter. Assuming team captain Damien Comer, Shane Walsh, top class free-taker Barry McHugh and other forwards who should see some game time, such as Burke, Seán Armstrong, Johnny Heaney, Paul Conroy, Eamonn Brannigan, Seán Kelly and Adrian Varley, get sufficient supply, they should have too much fire power for the Sligo rearguard. Walsh and his management team have constantly emphasised the need for consistency of performance, and this Sunday is a day to go out and produce a high level consistent display. Galway supporters are expecting the team to do a professional job. They should take nothing for granted on Sunday, but they need to get the job done and move on to a rematch with Roscommon in two weeks’ time. If the Galway players want to be considered a top five team, and progress to the All-Ireland quarter-final round robin series in the middle of July, they need to be able to beat Sligo with a bit in reserve. Page generated in 0.1164 seconds.